In arguing for border wall funding, President Donald Trump claimed — without any evidence — that only 2 percent of those apprehended crossing the border and released pending immigration hearings appear in court. Actually, Trump administration officials put the figure at about 50 percent, while immigration experts say it is even higher. The president made his remarks on Day 24 of the partial government shutdown, which began because Congress would not agree on Trump’s request for $5.7 billion in funding for a proposed border wall. The president was speaking at the American Farm Bureau Federation’s annual convention in Louisiana. Trump, Jan. 14: Somebody comes into our country, they touch one foot on the ground, and we have to catch them. It’s called, “catch.” We then take their names and we bring them to a court — can you believe this? — and we release them. … And they go into our country, and then you announce — these are the laws — then you say, “Come back in three years for your trial.” Tell me, what percentage of people come back? Would you say 100 percent? No, you’re a little off. Like, how about 2 percent? (Laughter.) And those people, you almost don’t want, because they cannot be very smart. (Laughter.) Two percent. Two percent. Two percent come back. Those two percent are not going to make America great again, that I can tell you. (Laughter and applause.) Crazy. It is important to note first that most people apprehended at the border are quickly returned to their home country. 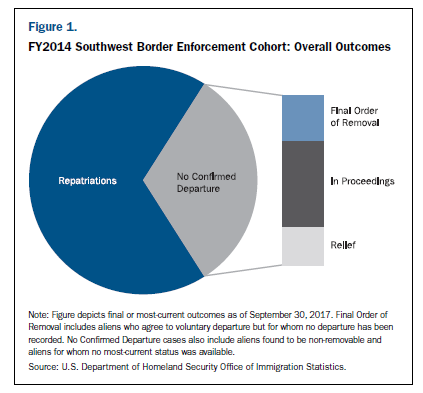 “Overall, DHS repatriated 65 percent of aliens encountered in 2014, with the majority (80 percent) of these repatriations occurring as expedited removals or reinstatements of previous removal orders,” according to the DHS report, which tracked the enforcement outcomes over time for people trying to cross the Southwest border legally and illegally in 2014. Mexican nationals, in particular, “are often immediately processed and removed,” as are those with criminal records, the report said. “Existing enforcement measures are highly efficient at repatriating Mexicans, convicted criminals, and single adults who do not seek humanitarian relief,” according to the report, which noted that 97 percent of those with criminal records were repatriated. However, DHS has criticized current laws and court rulings that favor the release of unaccompanied children and families from noncontiguous countries until their immigration status can be resolved in court – a process that can take years. The DHS report said that more than half of those from Honduras, Guatemala and El Salvador who were apprehended at the Southwest border in 2014 remained in the U.S. after three years, and about half of all those apprehended from those countries were unaccompanied children and families. But we found no evidence to support Trump’s claim that only 2 percent of those released return for court hearings, and no one from the administration provided us with any evidence, either. We contacted the Department of Homeland Security, which referred us to the White House. Hogan Gidley, the White House deputy press secretary, promised to respond “in a minute,” but never did. However, two administration officials testified about the subject before Congress, and both officials put the figure for no-shows at around 50 percent — not 2 percent. At an Aug. 16, 2018, hearing, Republican Sen. James Lankford of Oklahoma, questioned James McHenry, director of the Justice Department’s Executive Office for Immigration Review, specifically about unaccompanied children who are released and then fail to show up at immigration hearings. McHenry said “a little over 50 percent” of cases involving unaccompanied children crossing the Southwest border are decided in absentia. A chart on the website of the Executive Office of Immigration Review, which McHenry heads, shows the in absentia rate in fiscal year 2018 for unaccompanied alien children, or UACs, was 50 percent. Similarly, Matthew T. Albence, executive associate director for Enforcement and Removal Operations at the U.S. Immigration and Customs Enforcement, told senators at a Sept. 18, 2018, hearing that 53 percent of cases involving “family units encountered at the Southwest border in FY 2014” were decided in absentia. “As usual, I have no idea where he is getting his figures from and would suggest it is highly unlikely. This is so because those who are processed through the border are released from detention on an ankle monitor and have to follow a number of different procedures to help track them, all found to be highly effective alternatives to detention,” said Ayodele Gansallo, an adjunct professor at the University of Pennsylvania Law School who is a senior staff attorney with the Hebrew Immigrant Aid Society of Pennsylvania. Lenni B. Benson, who teaches immigration law at New York Law School, also questioned the 50 percent figure cited in congressional hearings by Trump administration officials. In a phone interview, Benson said the fact that a deportation order is issued in absentia does not mean that the person will be or should be deported. Too often, she said, noncitizens don’t know when to appear in court because they are given inadequate notices to appear. If given inadequate notice, noncitizens may seek to reopen their immigration proceedings, even though a deportation order was filed against them in absentia. Benson argued that the 50 percent figure cited by the Trump officials is “inflated,” because it is a snapshot in time. In other words, some who failed to show up and received a deportation order in absentia may nevertheless continue to work through the judicial system. When asked about the best available data on case outcomes, several immigration law experts referred us to a study published last year in the California Law Review that analyzed government data from immigration court cases initiated between 2001 and 2016. One group in particular — families seeking asylum — had a very high rate of showing up for court hearings. “We find that family members seeking asylum who were released from detention attended their hearings in 96% of cases that began in family detention since 2001,” the study found. The president frequently complains about what he calls “catch and release.” Last year, he claimed only 3 percent of those released show up in immigration court, while on other occasions he has said the released immigrants “never show up” in court or “nobody ever shows up.” But there is no evidence to support any of these claims. Correction, Jan. 25: This story was updated to correct the school affiliation of Lenni B. Benson, who teaches immigration law at New York Law School, not New York University. Claimed that only 2 percent of those apprehended crossing the Southwest border and released pending immigration hearings appear in court. Previous StoryVideo: Has ISIS Been ‘Defeated’?